Okay, not really. But he used to sing in the shower. Loud enough that I was forced to listen to it. He used to give nightly concerts, his repertoire including Broadway show tunes and some Bruno Mars. Had it been 5 minutes of humming in the morning, I would have had no problem with the singing. His showers were half and hour long, every day, always at midnight! So I complained to the building management several times and he stopped (hallelujah!). Now, for the past week, at midnight, right in the middle of his shower, a waterfall would form in my bathroom. Drops of water would fall from the ceiling right into my bathtub, dripping and dropping a new serenade. Seriously guy upstairs, you have painted quite the picture of yourself. Friends had the ugly naked guy, I have a show tune shower singer clearly lacking common sense! But really, last night it dripped again so it’s back to square 1! Although the plumbing is probably more to blame here than my neighbour. Argh, neighbours. Did you know that under Quebec law, you must suffer reasonable neighbourhood annoyances, according to the local customs. I think in this case, his behaviour is beyond the limit of tolerance. Did I mention I was loving this law for engineers class? Love love love. 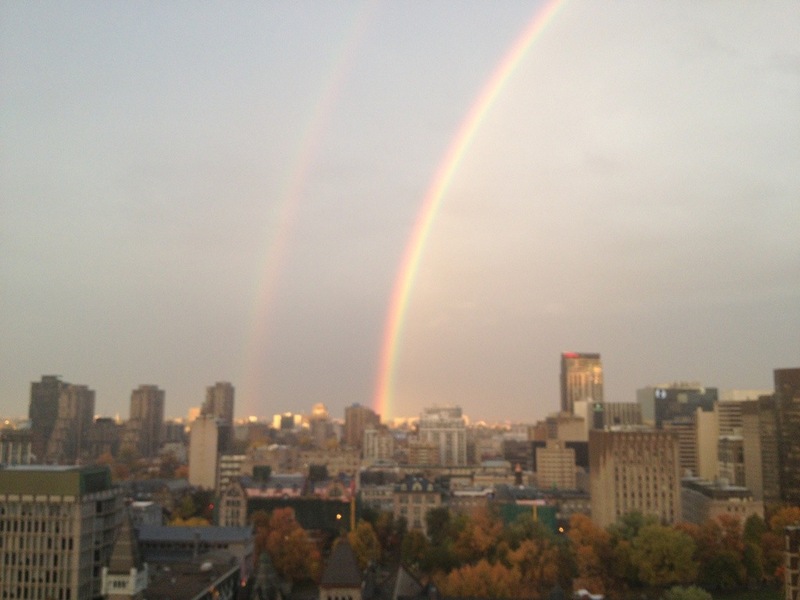 This weekend’s double rainbow, just cause.